Frozen tempered dark chocolate with assorted nuts and orange zest on top. This is by far the most delicious (French?) cake I have tasted. I am not a big fan of sweets or cakes but this was so heavenly that I finished 3 quarters of it. 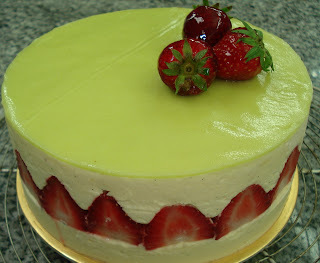 :-) Lady finger sponge cake was used as the base. 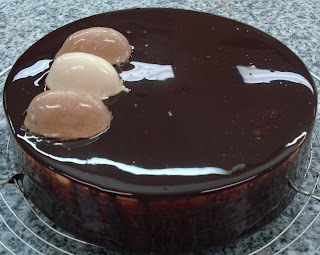 It was coated with cocoa syrup before the three layers of Chocolate Bavarian cream in 3 different flavors namely dark, milk and white were placed on top. Never place the next layer of cream when the first is still soft as it will collapse. Freeze every time you place each cream. This will help set the Bavarian cream fast. We used cocoa glaze to coat the whole cake. Once in your mouth, the Bavarian cream melts leaving your mouth screaming for more. I'm giving it 7 stars. Ha! The Bavarian cream wasn't supposed to be seen when glazed but because of the mistake we made, our "watery" glaze dripped leaving some parts exposed. This puff pastry was baked then cut into 3 strips of equal sizes. Each strip had a thin layer of raspberry seed jam. Between the strips, we spread diplomat cream. For the marble effect on top, we used white fondant as the base then we piped chocolate fondant crosswise. With the dull side of a paring knife, we cut the fondant at regular intervals (2 cm apart), one stroke inward the other outward. 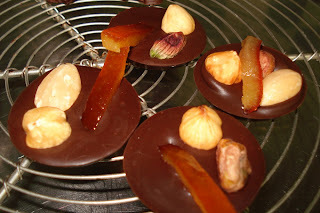 The sides were covered with feuilletine. I finished 3 minutes late at the practical today. At least I wasn't the slowest.